Many of you are probably knee-deep in Christmas preparations. We are as well. My college kids are home for Christmas break which means late nights, old friends coming in and out and my kitchen in near constant use. I wouldn’t have it any other way. But in 10 short days, the calendar will turn and we’ll be ushering in a brand-new year. As you look toward 2017, I want to invite you to a winter Bible study. 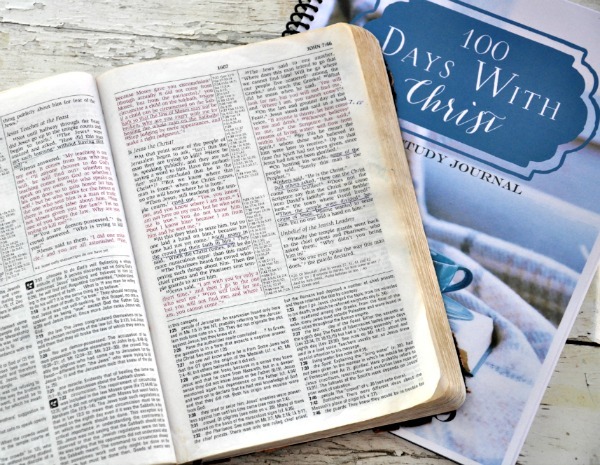 I’ve re-released 100 Days with Christ and I’ll be hosting this Bible study right here on the blog. 100 Days with Christ starts with Jesus in eternity past. The reading then moves with Him from village to Galilean village, as He teaches and heals and calls men to Himself. We’ll see the miracles and ministry of Jesus in full — fleshed out with the full color and detail that each of the gospel writers uniquely records. Having just celebrated the birth of Christ, January is the perfect time to begin studying the life and ministry of Christ. And as we approach the week of Easter, our study will wrap up with the arrest, crucifixion, resurrection and ascension of Christ. Hemmed between Christmas and Easter is a wonderful time to dig deep and study Jesus. First, download a free copy of 100 Days with Christ here. This includes the daily Bible reading plan, an introduction, instructions for the plan and journal pages to record your notes and prayers. 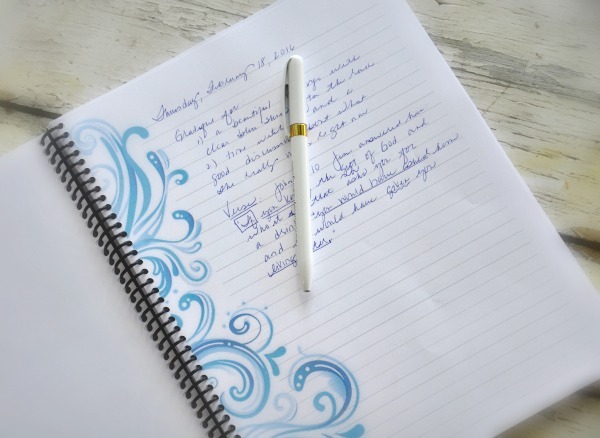 Second, you can use the reading plan and either write in your own journal OR have the reading plan and journaling pages spiral bound. I had my local copy shop spiral bind the reading plan along with 60 copies of the journaling pages, which provided plenty of space to record daily thanks along with favorite verses, observations and prayers. Next, I’ll be posting some of the key verses and truths we’re learning on Instagram so be sure to follow there. 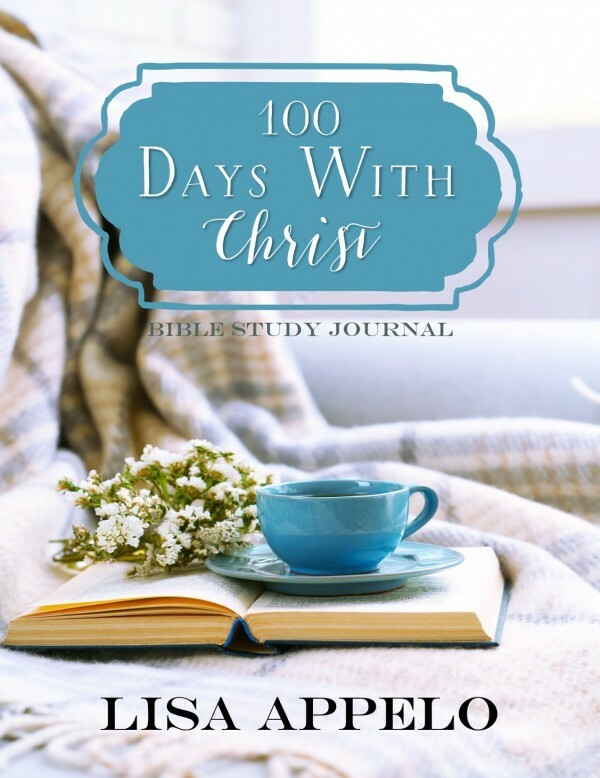 Finally, to help us stay on track and keep us together, I’ll blog through 100 Days with Christ. Next year, I’ll post on the blog twice each week. Friday’s post will center on a teaching from that week’s reading and will be relevant even if you aren’t doing the Bible study. Other weekly posts will be encouraging content not specifically tied to the 100 Days with Christ study. When does this study begin and end? We’ll start January 1, 2017 and end early in the week of Easter. Easter is Sunday, April 16, 2017. Some days are shorter than others, but generally, you’ll want to allot 20-30 minutes for each day’s reading. There will probably be days you don’t get to the reading. That’s okay. Don’t give up! Instead, keep moving with that day’s reading and only go back if you have extra time. Life happens and you’ll find it’s easy to get your daily rhythm again. Daily Bible study is a huge challenge for me. How can I make this work? What works for me is to make my Bible time priority reading before anything else – Facebook, emails, another book. I know I’ll read each day and if I make Bible study the first reading of the day, then it happens. Choose the same time to read each day. Give yourself an incentive – like a wake-up to hot coffee brewed with a timer. And ask God to give you a hunger for His Word that you can’t ignore: that’s a prayer smack within His will and He’ll absolutely answer it! I cannot wait to spend 100 Days with Christ along with you! Feel free to share this with anyone who might want this free Bible reading plan and journal. UPDATE: I’m received a few emails from folks who never received a welcome email with the link to download this Bible study after signing up. While 99% of our emails are received, some get blocked or bounce so if you do not see a welcome email in your primary, promotion or spam folder, please message me. Thanks so much! This sounds like a wonderful idea in preparation for Easter Sunday! I love reading about Jesus’ ministry and how he interacted with others. I am anxious this study sounds so wonderful, thank you and I can’t wait!!!! Glad you’re joining us, Gale! I got this Bible Study from you last year. I have have been using it for our Bible time in my homeschool with my children. We are really enjoying it. Thank you for taking the time to put the plan together. I would love to do your bible study. As a matter of fact, two ladies and myself get together once a month for a bible study and we were considering doing the gospel of John. So this works in well !! However, I have absolutely no idea about Instagram, so will have to find out before January, I can see.!!!! I think there could be someone else who would be interested as well, so let’s see, once Christmas is over. For us, it is the hottest time of the year and we don’t manage so well due to the heat and humidity. I expect those in the northern hemisphere are jealous ! Bless you for all that you do and may the Lord enrich you Christmas and see you safely through to the other side !! Wonderful, Lisa! I can’t wait! Yay! I love having a Bible study to look forward to and get me up in the morning! Silvia, yes this is a free download available to email subscribers. Once you put in your email, you’ll receive a welcome letter with the download to the full reading plan and journal. Lisa, I finished 100 days right around Thanksgiving time. I did it on my own. It was the best. I cannot recommend doing this study highly enough. And to do it along with you as you blog about it will be awesome I’m sure. Thank you for pulling together 100 Days, it is a great tool. Merry Christmas – and a Christ filled New Year to you and your loved ones. God bless you Lisa. And thank you for this. I’ve tried to load it and for some reason, I’m not able to. I love reading and studying with your posts. Sherry, did you get the email with the link to download 100 Days with Christ? I’m going to join you Lisa. I’ve been reading through the gospels this month and discovering things I’d never realized before, so I’m going to make this a priority. Glad you’re doing this, Sheryl! I remember Henry Blackaby teaching that he is always reading through one of the gospels and another book. But always one of the gospels. Oh my goodness, I love this so much! Just downloaded and am so pumped!! Yay! Glad you’ll be doing it with us, Keri! Oh, this is going to be good! You and I are in the same wavelength because my Word for 2017 is “Jesus,” as in more of Him. I’m also praying about offering a 7 day Bible study methods guide for the opening chaptets of John… not 100% sure, but I’m praying and thinking I will…good to read news of your family here too. Betsy, what a great 2017 word! I have tried several times to sign up for your study but haven’t received anything in my email. Please help! Ok..I have not received it as of yet..
I’ve tried 3 times to submit my email and I haven’t received a download link. I’ve checked my junk folder and there is nothing there either. What can I do!??! I got it! Thank you SO very much!!!! Cannot wait to get started! I haven’t received my download yet and it is not in my spam. Thank you, Melanie. I just sent you a welcome letter. Yes, I’ll send it directly! days Bible study and have not been able to find or get a link. Cane you help? And I am praying for you and your family. GOD Bless You! I have tried signing up for this 3 times I think…2 different days…put my email in, it says thanks, and yet I’m not getting the link to the download. Not sure if it’s because I’m already receiving your newsletters via email and it won’t let it send that one? Could you may be send me the link directly? Yes, it’s because you’re already receiving the emails. I just sent it directly to you. I pray this blesses you mightily, Dyan! Lisa, I have tried several times to get my 100 reading plan…I have tried looking in my spam file, too. Could you please help me? Would it be to much trouble to email to me? I have tried twice signing up. Still have not received. It is not in my spam folder either. Would love to start this today if I could get the link. Thanks! Every time I try to send a comment asking for the link it tells me my comment is awaiting moderation? Hi Kelly, an email has been sent to you. Please let me know if you still don’t see it in any of your email folders. So glad you’re joining us for this! I’m excited about following along. I’ve tried submitting my email a number of times without receipt of a response email or download link as of yet. Is there a link you can post here? Got it! Thank you! And a very Happy and blessed new year to you too! Looking forward to this Bible Study. I hope I can follow all of this as I’m not sure about instagram. This is awesome, Lisa! I would so do it but I am being called to pull back from a lot after this book launch team I’ve been on. I DO pray the ones who God is leading to it will find it and grow through it! Blessings to you sweet, friend. Keep on. You are shining bright! I haven’t gotten the link for the 100 day with Christ bible study. I just sent you the welcome letter with the link to download. Thank you for letting me know, Cindy! Hi Lisa..I just wanted to let you know I got the email with the study link in it..so excited..I will print it tomorrow. I also wanted to ask you the Bible that’s in your pictures here, what kind is it? I love how it has the maps in it..I would like to get one if possible..thank you! Hi Kathy, the Bible in the picture is an NIV study Bible. Here’s the link. http://amzn.to/2hUFbD4 It was as birthday present years ago and so well-used! I think you can find a hard-back w/o leather for a bit less. Hope that helps! Thank you so much!! May God bless your Ministry! Yes, that probably is the one since I got it waaaay back. Did you find one of those? Wow. I’m leaving a reply as I have not received the welcome email either. Thanks. I have tried several different times to sign up, but I have never received anything. Hi Kathy! Can you message me at lisa.appelo @ gmail.com (no spaces). Thank you! I lost my husband of 54 years on 6/10/2018. I would love to join the Bible Study. This is the hardest thing I have ever been through. I’m so sorry for your loss, Bobbie. Please message me if you don’t receive a welcome email with the link to the Bible study.